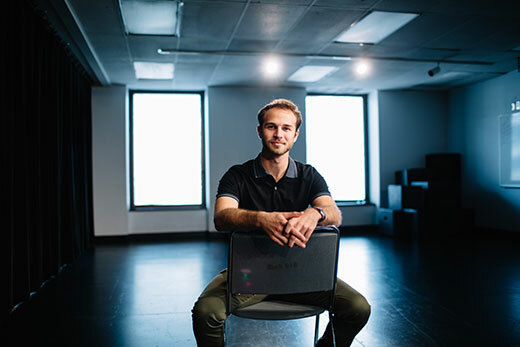 Emory College senior Cameron Frostbaum is using his honors thesis research to introduce local audiences to microtheatre, which began in Spain and features short plays performed for small groups in flexible spaces. One warm summer evening, on a rooftop patio in Salamanca, Spain, Emory College student Cameron Frostbaum 18C experienced a transformative night of theater. There he witnessed his first performance of microtheatre, a form that originated in Spain, characterized by intimate, short plays performed for small audiences in flexible spaces and informal performance formats. “I returned to Emory determined to bring microtheatre to Atlanta and inspired to find a new relevance for theater for the next generation of spectators,” says Frostbaum, an Atlanta native double majoring in theater studies and political science. This fall, upon his return to campus, Frostbaum jumped into action, producing the first Microtheatre Emory event. More than 100 people roamed the Music, Literature and Arts Outreach (MLAO) House, watching several student-written and directed short plays. Now on Monday, March 26, Microtheatre Emory returns to the MLAO House for a second round of performances. These microtheatre projects are a part of Frostbaum’s honors thesis research. Over this past winter break, a grant through Emory College’s Undergraduate Research Programs allowed him to visit the only microtheatre in the country, Microtheater Miami. Upon graduation, Frostbaum is determined to use the lessons he’s learned through studying and producing microtheatre to give back to the Atlanta community. Microtheatre Emory presents four student-produced, written and directed plays March 26 at 7 p.m. in the MLAO House at 14 Eagle Row. Tickets are $5 and include refreshments.